In logistics operations, the commitment to safety is all too often like the half-hearted embrace we give to an older aunt we occasionally see at family gatherings. We do it because we have to and it’s expected. But we’re not giving safety the full-on bear it hug it deserves. We must move beyond papering the walls with pithy slogans – “safety is no accident!” – and begin the hard work of driving accountability to the associate level and empowering those who do the work. 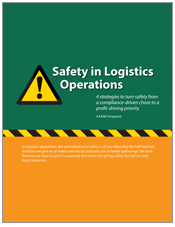 This eBook examines safety investments from an ROI perspective, and then oﬀers up 4 strategies to improve safety performance in your logistics operation.